Based out of South Carolina, TwelveSouth makes high-quality accessories for Apple devices, including some for the Apple Watch. I got the chance to try their TimePorter and Forté accessories. When I travel, I rarely bring additional Apple Watch bands with me – I usually just pack my charger. The TimePorter is great for me, then, because it functions as a charger, charging stand and stores several watch bands, too. The charging cable is wrapped inside the case and pressed into the lid, with a little notch to run the USB cord out of the side of the case (see above). 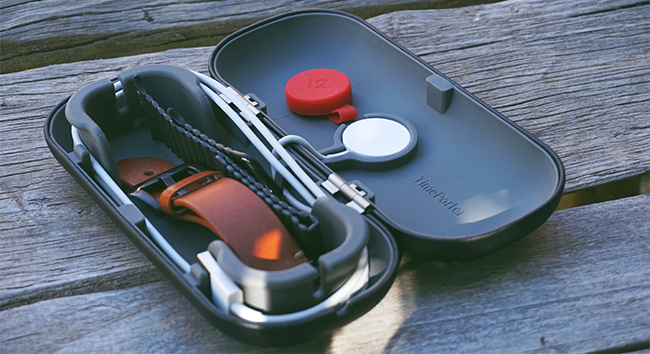 The cable storage, band storage, and charge-through functionality makes this a really handy choice for those who travel often with their Apple Watch. The size of an eyeglasses case, TimePorter easily fits in my carryon when I travel. Some may even consider getting a lipstick USB battery to actually charge their Watch in the case, no AC power required. I’ll definitely be using the TimePorter for my Watch travel from now on – it’s available in white or black from Amazon here. There are a plethora of Apple Watch stands on the market and even the TimePorter above is technically a “stand” of sorts. 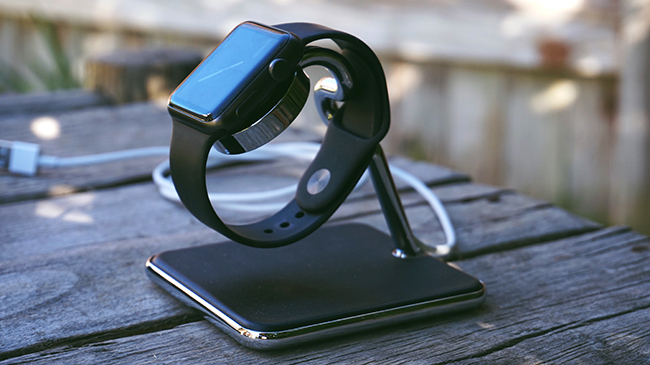 Nearly all available Apple Watch stands require that you use your existing magnetic charger that came with the Watch, and the TwelveSouth Forté is no exception. On the Forté, your watch can be displayed both vertically (see above) or horizontally (Nightstand Mode). There’s a curved arm that will allow you to charge your watch regardless of the type of watch band you use. 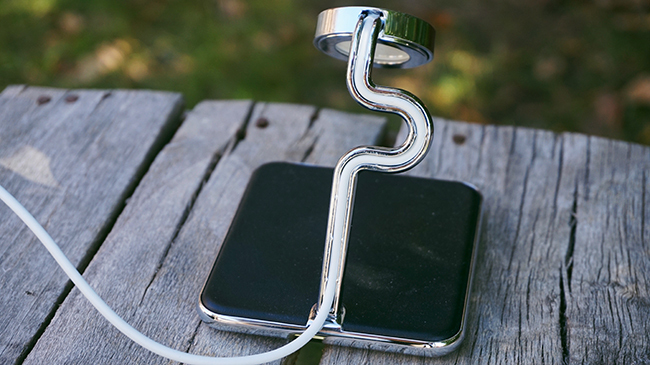 Your charger magnet holds it very securely in place. The Forté is a solid stand, too, with a heavy weighted base and stainless trim with a black leather pad over the base. Your charging cable is pressed into the back of the stand (pictured above) and fits under a plastic ring to secure it into the top. There’s very little movement on your desk or table once you’ve set it down, because of the significant weight. TwelveSouth’s Forté retails for $59, and once you hold it in your hand, you realize this is a weighty, quality stand, and worth the cost. Even the way the stand is packaged with a red ribbon to remove it from the box says “quality.” This is a good gift idea for the holidays. Forté is available direct from TwelveSouth here. This entry was posted by admin in electronics, gifts and tagged 12 south, twelve south apple watch, twelve south apple watch accessories, twelve south apple watch case, twelve south apple watch stand, twelve south forte, twelve south time keeper on November 29, 2016 .